I was never an aubergine fan! Never liked it as a kid. There’s something in their gooey texture ,when cooked, that kids do not like aubergines much. So whenever my mum cooked baby aubergines and potatoes , I used to take out the potatoes and eat all of these, leaving the aubergines to be finished by the grown ups! 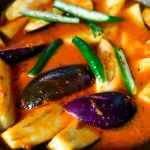 I really liked the rich garlic and tomato flavour that she used to add to these- whether it was a dry aubergine vegetable, or the baby aubergines and potato curry, that she makes- she used to feed it to me by tricking me to believe it is fish curry, and believe me I just loved the taste of it sans the aubergines! 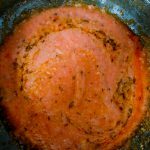 But now this curry, simmered in rich tomatoes and infused with lots of garlic flavour is one of my favourite curries.Guess what? I like aubergines as well now. 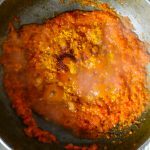 This recipe is very easy, and requires very few ingredients, compared to some other Indian curries. 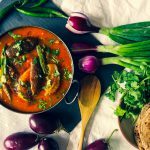 One very important ingredient of this curry, which is normally not used in curries, is the carom seeds (ajwain). 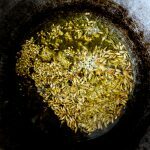 Yes, I suggest you do not avoid adding these, as these give that rustic, and strong flavour to this curry, and it will not taste the same without the carom seeds. 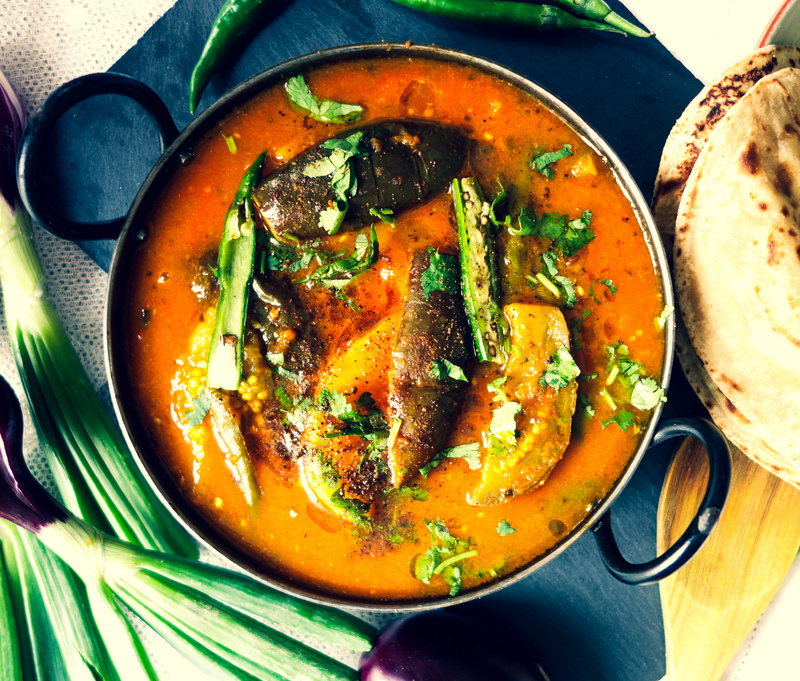 For this curry, you can use either the long baby aubergines, or the small round ones. I make them with whichever aubergine variety is available to me . Both taste good. 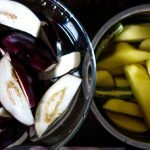 My mum always made these using the long aubergines.I have tried both, and you can use whichever variety is easily available to you. Baby Aubergines, potatoes, a small onion, lots of tomatoes, lots of garlic, green chillies. And the dry spices needed are carom seeds (ajwain), cumin seeds (jeera), hing (asafoetida),kauri methi (optional), salt, turmeric powder and chilli powder. Wash and slice the aubergines and potatoes lengthwise. 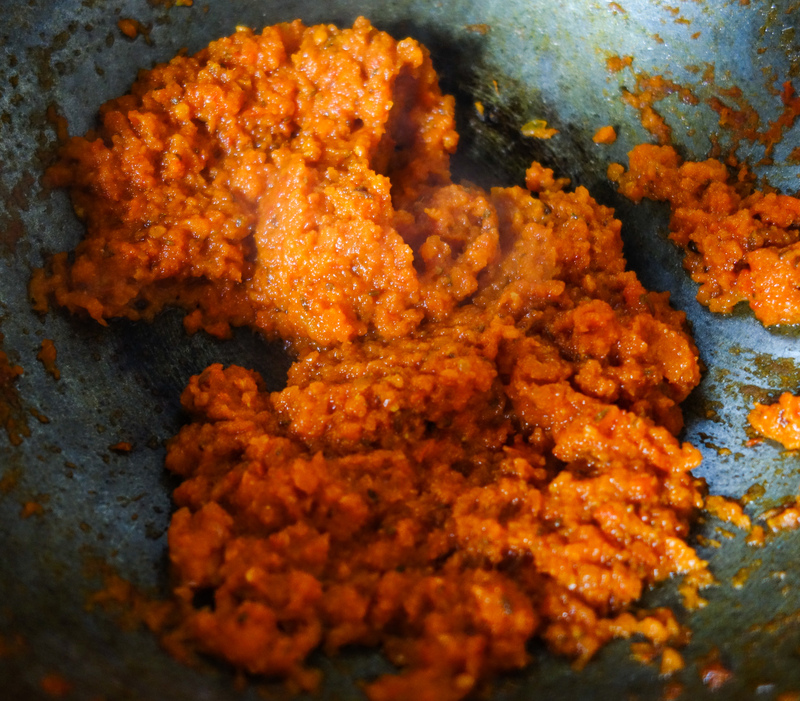 In a mixer/ blender, blend onions, tomatoes and garlic to a fine puree /paste. In a separate thick bottomed pan, heat mustard oil.I cook this curry in mustard oil as it gives a really nice flavour to the curry. You can use any oil of your choice, or even ghee if you want to. 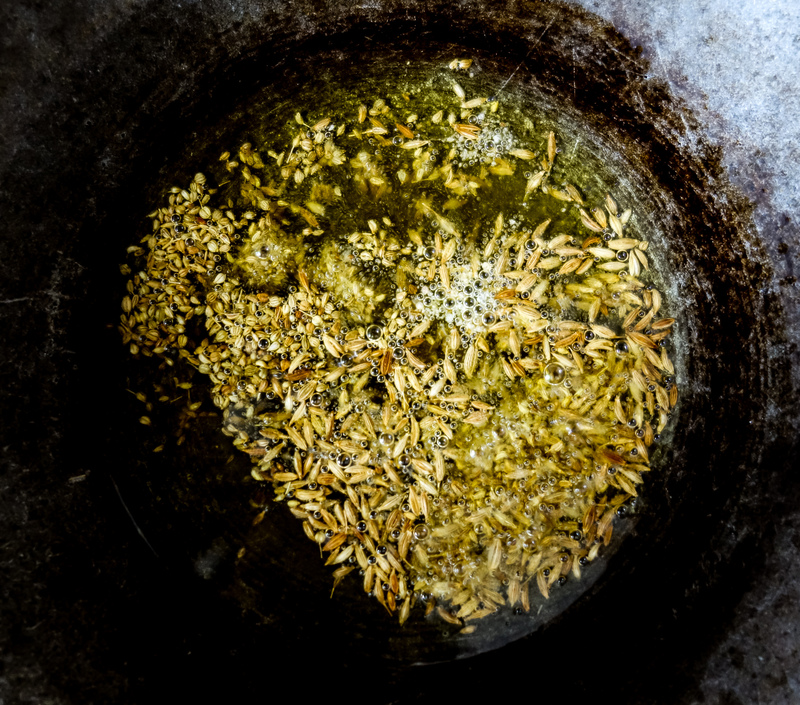 Once the oil is hot, add carom seeds(ajwain), cumin seeds(jeera), and asafoetida powder (hing). Sauté for a second, and add the onion, tomato, garlic puree. 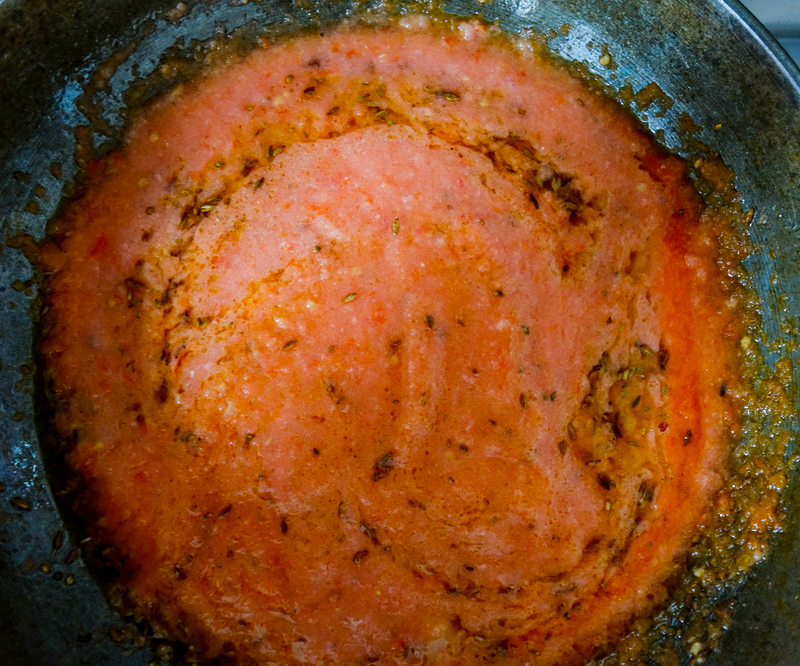 It will splutter all over as the qty of tomatoes is more in this puree. Immediately cover it, and let it reduce on medium heat. Keep stirring in between. 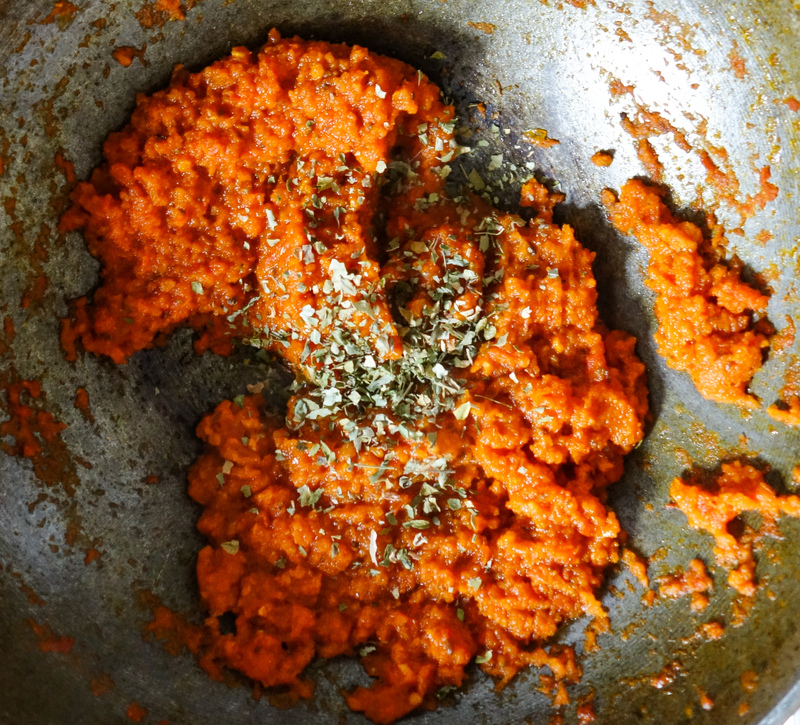 Once it has reduced, add Salt, Turmeric powder (haldi), and red chilli powder. 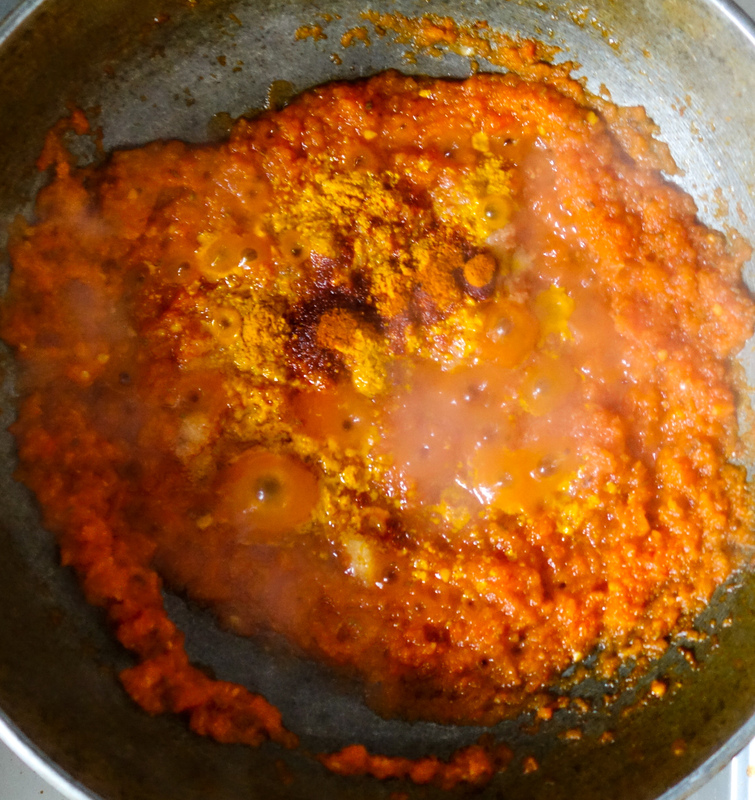 Mix well, and let the masala thicken till it starts leaving oil on sides. Add Kasuri methi (Dry fenugreek leaves -handcrushed), and mix well.Adding this is optional. If you do not have kauri methi, you can avoid adding this. Now add potatoes, and baby aubergines. Add green chillies.Mix well. 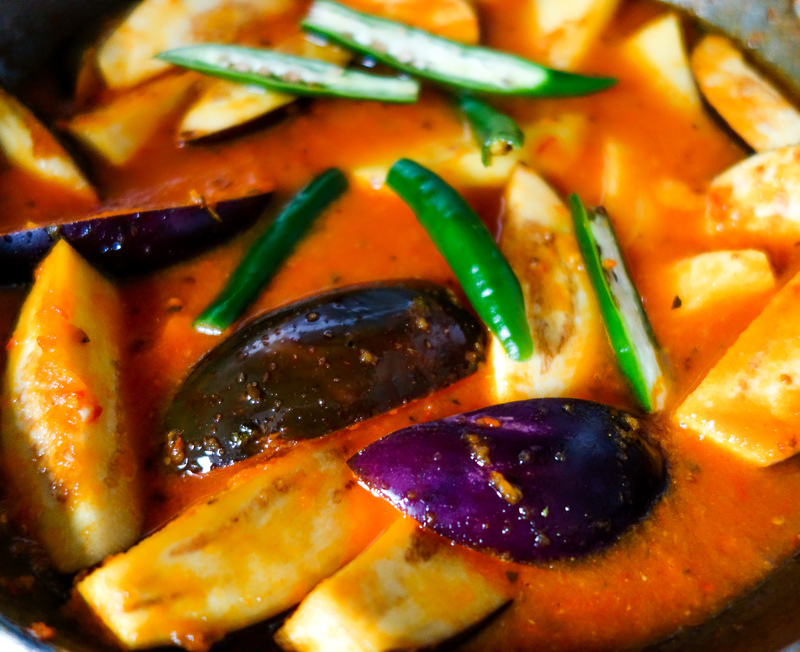 Add water as per the consistency, and let the curry simmer on slow heat for about 10-15 minutes, till the potatoes and baby aubergines are cooked. Once cooked, sprinkle a little garam masala on top. Garnish with fresh coriander leaves and chillies. I love this curry with steamed rice. 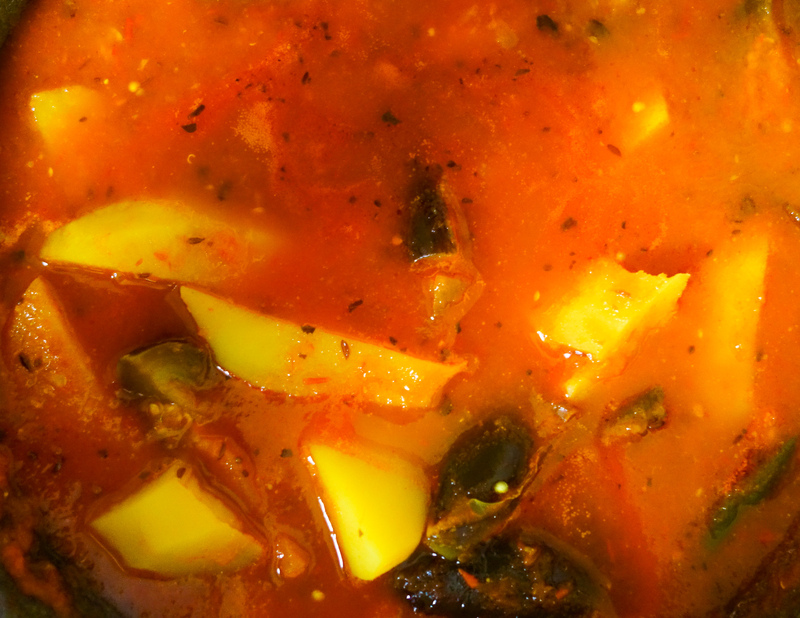 But this tastes as delicious with hot roti, paranthas or even naan bread!. Serve it hot with a side of pickle, onions, and raita. If you try this recipe, I will be happy to know it ! Leave a comment ,your suggestions, questions and feedback in the comments section below.I will be happy to revert. 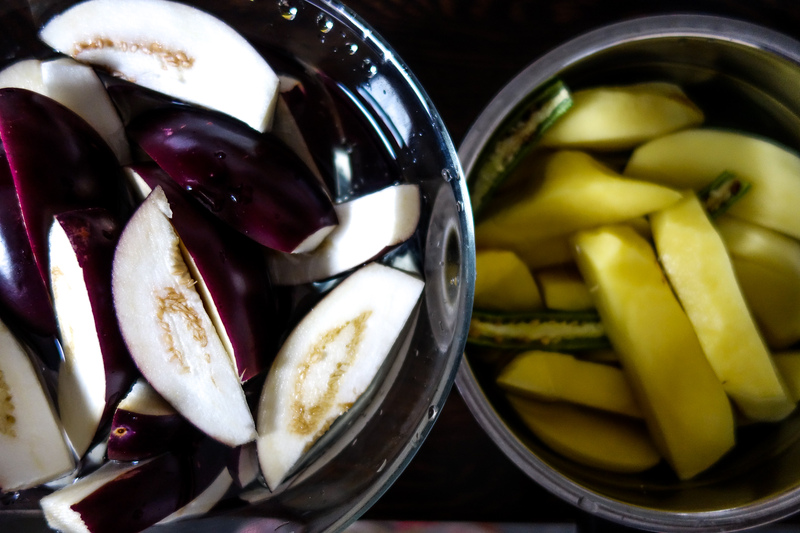 Wash and slice the baby aubergines and potatoes lengthwise. 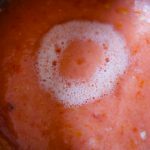 In a mixer/ blender, blend together onions, tomatoes and garlic to a fine puree /paste. In a separate thick bottomed pan, heat mustard oil.I cook this curry in mustard oil as it gives a really nice flavour to the curry. You can use any oil of your choice, or ghee if you want to. 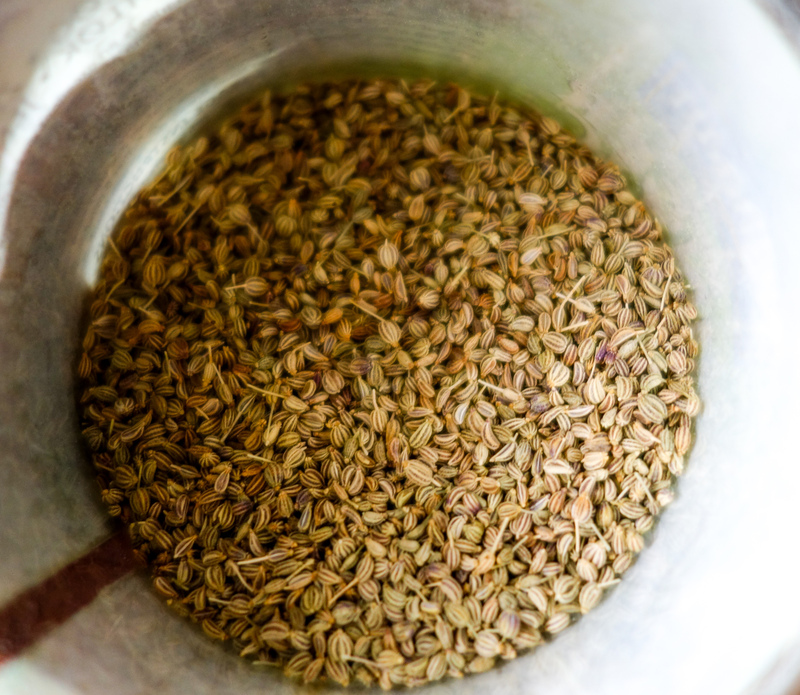 Once the oil is hot, add carom seeds(ajwain), cumin seeds(jeera), and asafoetida powder (hing). Sauté for a second. Add the onion, tomato, garlic puree. 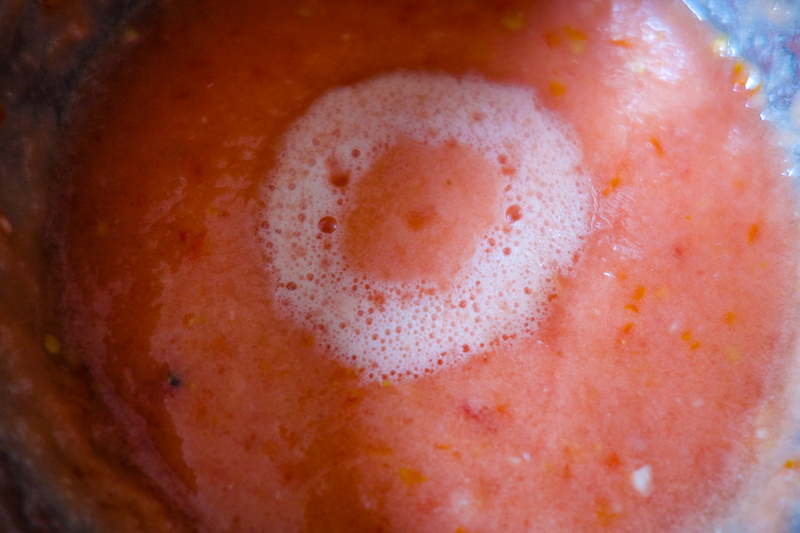 It will splutter all over, as the qty of tomatoes is more in this puree. So immediately cover it, and let it reduce on medium heat. Keep stirring in between. 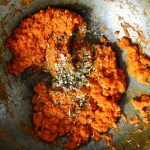 Once it has reduced,Add Salt, Turmeric powder (haldi), and red chilli powder. 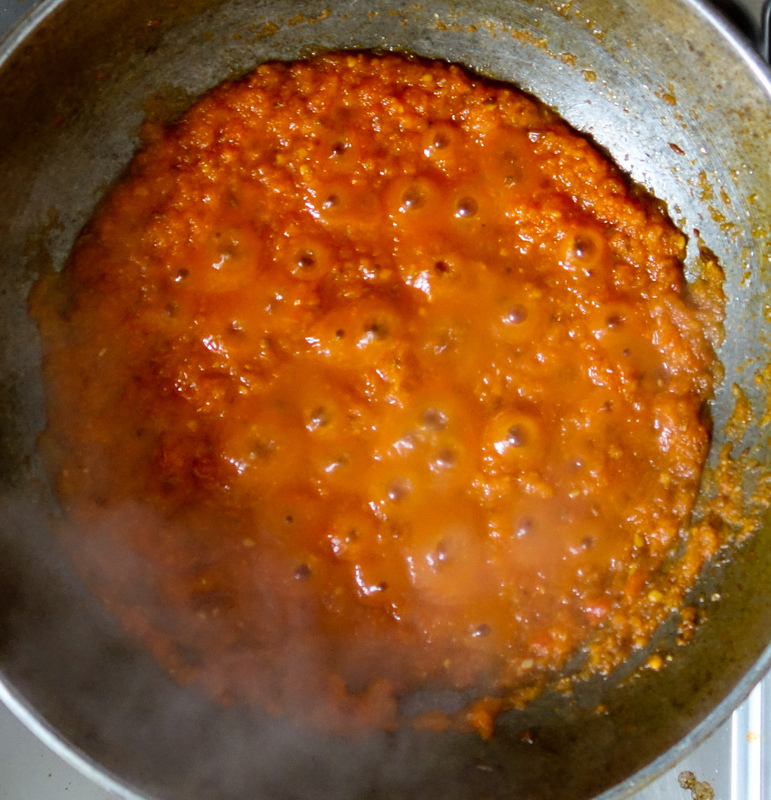 Mix well, and let the masala thicken, till it starts leaving oil on sides. Add Kasuri methi (Dry fenugreek leaves -handcrushed), and mix well. Now add potatoes, and baby aubergines. Add green chillies.Mix well. 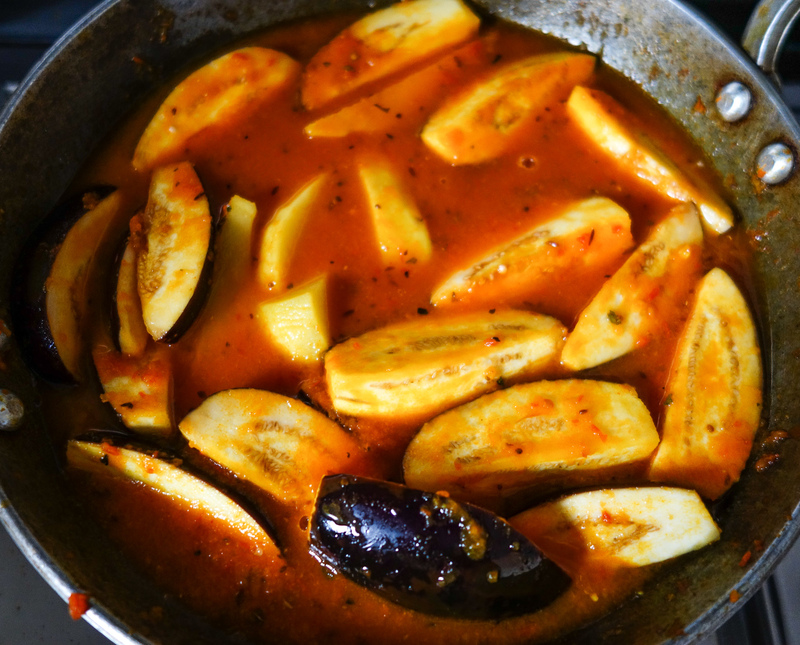 Add water, and let the curry simmer on slow heat for about 10-15 minutes, till the potatoes and baby aubergines are cooked. You know the potatoes are cooked, when they are tender and break easily with the spoon. Once cooked, sprinkle a little garam masala on top. 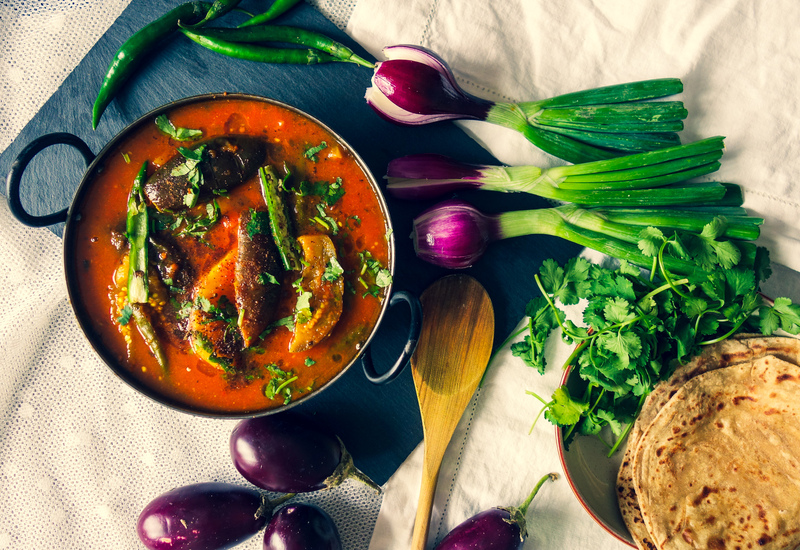 Garnish with fresh coriander leaves and chillies. I love my curry with steamed rice. 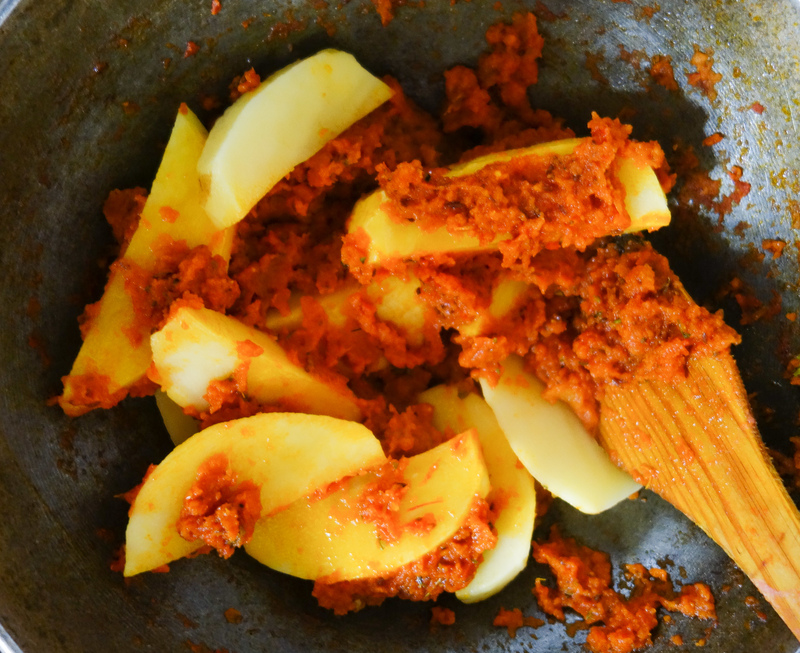 But this tastes as delicious with hot roti, paranthas or even naan bread!. Serve it hot with a side of pickle, onions, and raita. If using mustard oil, the first heat it to the smocking point, until it reaches a temperature where the first wisps of smoke appear (about 480°F/250°C). Immediately take it off the heat and allow to cool to a more reasonable frying temperature (around 360°F/180°C) before adding other ingredients. This procedure removes the acrid taste of the raw oil and renders it quite pleasant.